We all know that books change lives. And if you are a longtime bookheart, you know that I started as a very young reader and give credit to certain authors for shaping my youth with colorful stories. 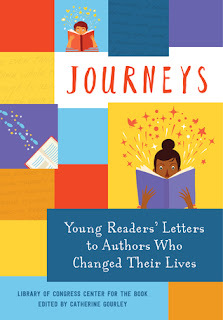 Well finally we have a book to prove it: Journeys: Young Readers' Letters to Authors Who Changed Their Lives. This collection is 52 letters from the Library of Congress' Letters About Literature contest. There is nothing like sharing thoughts about a book you and a friend have read. It is an automatic connection with another human being; the written word is a powerful thing to have in common. Reading this collection brought a smile to my face and a warm fuzzy feeling knowing that the same books I read in my youth also had an effect on today's young readers. It was enlightening to read letters by students in grades four to twelve tell how their lives changed. For example, The Long Winter made a student understand what it feels like to worry about not having enough food. It wasn't always easy as going to the store. Another student related to Shades of Black because she is the "gingery brown in a cookie" and knows that diversity is a good thing. And most of all, one student had the same thoughts as me when I read Lord of the Flies in the eighth grade: stand up to the Jack in your life. If not, it can lead to group mind. Let us not forget the classic authors, Dr. Seuss and Judy Blume, whose work also impacted young readers. I highly recommend this book for middle to high school students, teachers and parents. It is a great reference to discovering authors you, or your child, might not have read. It is especially a great guide for parents (like mine) who encouraged summer reading. Gift this to the young bookheart in your life and challenge him/her to write a letter of their own. Encourage young bookhearts to put down the game console, TV remote and iPad. Pick up a book and read. Happy Early Pub Day! Journeys: Young Readers' Letters to Authors Who Changed Their Lives will be available on August 1, 2017.